100% cotton. "Legacy" relaxed bucket hat with "CCDS" embroidered in white. 100% cotton. "Headsweats" race hat grey. Performance Headware. 100% polyester. "Legacy" Relaxed Twill white solid cap, with "1926 Cincinnati Coubtry Day" blue circle patch on front. "Headsweats" race hat navy. Performance headware. 100% polyester. 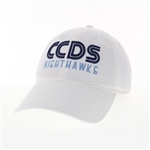 "Legacy" Relaxed Twill solid cap with "CCDS Tribe Pride" on front. "Legacy" white bucket hat with "CCDS" in navy blue embroidered. 100% cotton. "Legacy" Old Favorite Trucker cap with "CCDS" embroidered on front and side Indian head. Khaki Cap w/Navy "Cincinnati Country Day" embroidery Navy Cap w/Columbia Blue "Cincinnati Country Day" embroidery "Legacy" Vintage SERGE adjustable cap (denim). "CCDS" embroidered and side Indian head. 100% polyester. "Legacy" Relaxed Twill adjustable solid cap in navy color with "CCDS" Indians stitched on front. 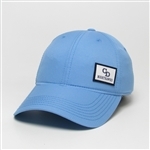 100% cotton "Legacy" Oxford Cloth adjustable light blue cap with embroidered CCDS on front. 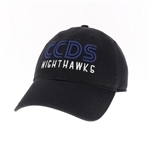 100% cotton "Legacy" Oxford cloth adjustable cap dark blue with "CCDS" embroidered on front. 100% cotton. "Legacy" Relaxed Twill trucker cap adjustable. White front with "Country Day Indian" patch. Navy black.